Turns out that thing aren't always simple as they seem at first glance. I spent more time than planned on overhauling the weapon pickup and replacement system i wrote about in the previous dev log. Apparently, despite the system being laid out well, there were some hurdles that appeared. First of all, the weapon switching system that was meant to be extremely basic and function by simply activating and deactivating children objects (weapon objects with firing FSMs) on the gunpoint of the ship proved too common for the concept of weapon equipping, upgrading and dropping during the game. I upgraded the system and while it's very complicated and probably can be laid out a lot simpler, it works as intended. Upon starting the game, Player is spawned, its child Gunpoint, and Gunpoint children, Basic Weapon Object (Level 1 out of 5 weapon) and Empty Weapon Object. You're probably wondering why would i put something like Empty Weapon when it's not even used, but we'll get to it. Every Weapon Object has two FSMs, Main FSM, used for the upgrade system, and Firing FSM, used for firing the weapon. Gunpoint object stores the Weapon Switch FSM. Bear in mind that Weapon Object can also be Weapon On Ship, or a Weapon Pickup, depending on the state in which it is and the fact that Player can have two weapons equipped, but only one active at the same time. Weapon Upgrade System - how it works? Main FSM controller on the Basic Weapon Object enters the first state. It searches for the Gunpoint object (place on the ship where it will be spawned. Search is done by tag, since it is quicker than searching for it by name). When it finds it, it stores it in the variable. By checking if the Weapon Object is childed to a Gunpoint or not, the Main FSM is branching in two directions, which determines if it's really a weapon equipped by Player, or a Pickup waiting to be collected. Shorter branch is executed is if the Weapon Object is a child of the Gunpoint object. It is then stored in the Weapons On Ship array, and the Main FSM finishes it's job for now. That means that it is a weapon equipped by Player and it can be fired. If it is not childed, it means it's a Pickup (drifting in space, waiting to be collected), its Firing FSM is disabled, a child which is an animated circle indicator for easier visibility is activated and the state machine starts its next event. Simplest case occurs if the same weapon type of maximum upgrade level exists on the ship (checked by iterating through the Weapons On Ship array). "Weapon is at maximum upgrade level" message appears, the pickup eventually leaves the screen and it is despawned. If the same weapon type of lower upgrade levels exist on the ship, it is upgraded. If the pickup is of the same or lower level than the weapon on the ship, the weapon on the ship is upgraded by one level. But if the pickup is one or more levels higher than the weapon on ship, the weapon on the ship is upgraded to that level. So, you get a pickup and it upgrades your weapon by one or more levels and it disappears. In game terms, it sounds simple, but actually there's a lot of mechanics behind it. For example, Player is equiped with Level 1 Weapon, and there's a Level 1 Weapon Pickup which we collect. Level 1 Weapon Pickup iterates through the Weapons On Ship array, and it finds the Level 1 Weapon of the same type. It gets the position of the Gunpoint object, spawns Level 2 Weapon and adds it to the Weapons On Ship array. It also checks if the Level 1 Weapon in the array has its Main FSM enabled or not. If it is enabled, that means it's an active weapon (we'll also get to it when we get to the Weapon Switching mechanism), which means that the Level 2 Weapon that is spawned should also be active which is done by activating Firing FSM on Level 2 Weapon nad adding it to the Active Weapon array (needed for the Weapon Switching mechanism). Firing FSM on Level 1 Weapon is disabled, it is removed from the Active Weapon array, removed from the Weapons On Ship array, Level 1 Weapon equipped on ship itself is despawned and Level 1 Pickup is finally despawned at the end of the last state. If the Level 1 Weapon on ship is inactive (its Firing FSM is deactivated), the Level 2 Weapon also spawns with its Firing FSM deactivated, but is not added to the Active Weapon array. Finally, switching the weapons. First we need to make sure that the Player can't cycle between the equipped weapon and the Empty Weapon object. As long as the Empty Weapon is in the Weapons On Ship array, cycling is not enabled. When it is no longer contained in the array, Player can freely switch between weapons. Every switch gets the first and second index numbers of the Weapons On Ship array, stores them as Weapon 1 and Weapon 2 variables, enables and disables Firing FSM on them, adds the Weapon Object with enabled Firing FSM to the Active Weapon array, and removes the Weapon Object with disabled Firing FSM from the Active Weapon array. We need the information about the Active Weapon so it can be replaced with the pickup that is different from it. That enables the Player to upgrade the weapon of the same type as the pickup on ship whether it is active or not, or select which weapon will be replaced (if both are different from the pickup) by simply switching weapons to active or not. Oh, by the way, you can visit www.fatpugstudio.com for version with bolded arrays, objects and things of interest, it didn't copy it nice. I've been on a month+ hiatus due to exhaustion and some personal stuff, but the things are ready to move forward now. I had some issues with the weapon switching system, mostly due to my inept dealing with arrays, but the fresh mind made things alright. As usual, it was just a minor unwanted behaviour (removing the array item which resizes the array instead of rewriting the value on the actual item position) which was hard to spot due to system complexity. Pickup and upgrade system, and together with them, HUD showing the active and inactive weapons as well as heat levels is working good now. Such a joy to see a simple system work, and the knowledge that a massive system is actually behind all of that is priceless. Anyway, now that the most of the elemental mechanics are done, it's time to make a full time commitment to the actual gameplay. Let's do a small recap of how things work in an endless mode. 3 + 0 60 seconds waves with a warp sequence between each of the waves to give player time to rest. At the end of the last wave, you fight the random variation of the first level boss, and warp into level two. 3 + 1 60 seconds waves with a warp sequence between each of the waves to give player time to rest. At the end of the last wave, you fight the random variation of the second level boss, and warp into level three and so on. I will make it quite hard to reach and beat the last boss, and even if you do so, you start all over again, but with bigger score multiplier and tougher enemies. Now let's go a bit in-depth. As i mentioned earlier, 5 spawners are scattered on each side of the screen which makes a total of 20. During the first wave, only the spawners on the right part of the screen are active and only one at a time can be active. That means that if a spawner spawns a wave of enemies that lasts for five seconds, no other enemies will be spawned during that time. To avoid waiting for the next one to start if you destroy them quickly, the wave also ends when you destroy all the wave enemies and the next one automatically starts. Squadrons separated in a few classes (Big, medium, small). Classes are determined by EXP (higher EXP unlock bigger and harder squadrons). Squadrons are a pain to make, they are a combination of a few enemies in a predetermined pattern (for example, a bomber protected by a few fighters flying in an arrow pattern). There needs to be literally a few hundred of them. Waypoint enemies. Single enemy types following a certain movement (spline or bezier) and shooting pattern. Single enemies. Usually very big enemies or few small enemies spawning on a random spawners in a random patterns if there are more than one. When all of there are combined (along with random events like meteor rain and similar stuff), with randomized spawning locations and spawning based on EXP variable they should all provide an adaptive and enjoyable play experience. Finally started on prototyping the endless wave system. Here's a small update on the wave system, it's growing into a spaghetti monster! The start wave is the first wave that spawns enemies from a "small wave" pool of enemies, random wave, random squadron (but inside players experience points limit), the it goes to the "check experience points" state, where it check if you're inside threshold for starting the boss wave. If you are, further spawning stops until all the enemies on screen are killed or went offscreen and then the boss wave commences. If you are not, it checks how many enemies are on screen (every enemy that spawns adds a certain value into array which is being checked). So if there's already a lot of enemies on screen you're probably not doing to well and the game will send only a small wave again. If the screen is almost empty, you're bound for a big wave incoming. Also, every wave has it's duration based on type of enemies in it etc. And a small gif i made for today's #screenshotsaturday on twitter, amazing feeling to see things getting shape and all that backend work turns into something that can be seen and played! As someone who learned to do pixel art by spending countless hours staring at Bitmap Brothers games, this is looking great. Keep up the good work! Those purple ships in the earlier screenshots are gorgeous. Thank you! As i mentioned, all the credits go to Lighterthief, a pixel artist from Netherlands, he's been doing a really good job under my guidance. I have done and i will be doing the backgrounds, that's actually been going good to me, not much of a pixel artist otherwise. Btw i loved bitmap brothers style, it was really unique. Really interesting breakdown of something I kind of took for granted in Shmups which is how you design the wave patterns without making them unfairly punishing. This looks really nice! Would be cool to see some comparison of patterns similar to the grid of graphs visualised above. I must admit it's a system that needs further tweaking and finer granulation. My goal is to make an optimal gaming experience, and there are two possible mechanisms i can use utilizing the current system of adding ships' "weight" to a pool. As already mentioned, every ship holds a different value, small ones from the screenshot are worth 1, and that nasty marine carrier is worth 5. When they appear on-screen, the total value in the pool is 10 (five small ships worth 1, and one big ship worth 5). The pool size is growing with players experience, which increases by killing enemies. Would be cool to see some comparison of patterns similar to the grid of graphs visualised above. What do you mean? Mockup of a wave of ships moving on path using different easing? Hmm it is a difficult balance between flow and breathing space. Yeah, I would be really interested to see what it looks like in action! Got some free time so i did a few variants. These are just hastily made, without any special tweaking of time or look ahead, but you get the idea about the possibilities, especially with multiple ships involved. All of that can be done in code too with regular physics, but tweening makes it quicker, easier to adapt and reusable. 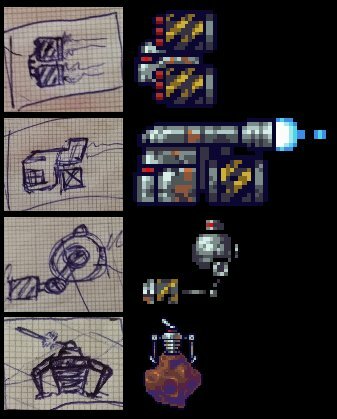 Here's how the design goes, i doodle at night, mister Lighterthief turns my fantasies into pixel reality. Here is another dev born in early 80s. I can see your progress. It is looking good, just keep in mind that the thing that will take you most time will be designinig levels and making them right. Programming is the smallest thing from the whole thing. I'm quite busy with my Adaptive Difficulty System as i call it, but today i'm having some fun, so i put debris for larger ship explosions and implemented some composite killables. Second one is in twitter link, sorry, i accidentally erased the gif from desktop. I joined all the Endless Wave System posts into one and made further additions, it's a good read! Endless Mode, for now, will be the backbone of the game. I don't much like the term, but let's call it Roguelike. For those not unacquainted with the term, it's pretty simple. The basics of roguelike games are permadeath (which means you start all over when you die) and procedurally generated levels. Procedural is basically a fancy catch-phrase for controlled random. It means that the levels are made by parametrized procedures that keep the random factor under control by defining the aforementioned procedures, certain value ranges and all sorts of parameters you want randomized. Anyone ever trying to make a completely random piece of any sort of art, be it visual or sound, knows that it usually turns out horrible. With the assistance of parameters like harmonies and scales in music, or color palettes, fractals and similar stuff you can get bettes results, but without the human input it's usually a meaningless chaos with only glimps of something human-like. You start the game with 0 Experience Points (the first variable), empty Enemy Value Pool (the second variable) and empty Enemy Array (the third variable, let's call it Enemy Counter from now on). Enemy Value Pool is the value of all enemies present on screen. When they appear, their value (based on their characteristics, HP, weapons, etc.) is added to the pool. When they are destroyed or they leave screen, their value is subtracted to the pool. The Enemy Array is simply a counter of the enemies present on the screen, when the enemy appears, it's added to the array, when it disappears by means of leaving screen or death in flames, it is removed from the array. The thing is, Enemy Value Pool has a limit that is based on your experience level and it is raised higher as you earn more experience by destroying enemies. Enemy Value Pool works in conjunction with both experience points and the Enemy Counter and it is crucial for the difficulty level adaptation. The game will never spawn more enemies than the pool can hold, so it ensures a gradual progression in difficulty based on your skill. If you're not such a good shot, experience will rise slowly, and with it the pool size. If you are a hotshot and hit 'em dead on the spot, you will progress much faster, get upgrades much faster and get to the bosses faster. So what's the Enemy Counter for? Тhe Enemy Pool Value has a certain limitations without it. You can have a pool half empty, but a lots of small enemies on screen that already pose a challenge by sheer numbers. Based by Enemy Pool Value only, the system will start an event of filling it up by spawning more enemies. The Enemy Counter serves as a fail-safe system against this. Instead of spawning more enemies, it will either delay further spawning if the number of enemies it too large, or perhaps launch one big enemy to add some variety to the situation. Now this is the actual procedural generated crap that is to be avoided, but when used properly it functions great. What does that title actually mean? There are several enemy spawn points scattered all around the screen, by utilizing this approach, depending on certain variables, they will spawn single enemies that follow their own behavior, be it the regular "move forward and shoot" or something else. There are some cool thing regarding this. For example, i can spawn 1, 2 or 10 ships in a random pattern based on the players experience level or number of ships already on screen. They act like fillers, we already have one or two squadrons on screen, so let's drop a few more small baddies that do their own thing. It also keeps the players on toes since they don't know what to expect. A horrible drawback is that things can get too random if not controlled by various parameters that need to be finely tuned, like mutual distance that avoids overlapping the sprites. Utilizing all this stuff drives the game away from the classical "memorize the pattern while moving on rails" type of play. It takes a lot more time to work on but definitely keeps every game session exciting and fresh and rises replayability to a whole new level. Unfortunately for some, and in contrast to a usual Roguelike practices, not using seeds for procedural generation means you won't ever be able to replay the game you just played, but i see it as a great thing. It can be further improved by introducing a case-switch which i will do in the next iteration. It will further simplify the machine, but i don't think it can go simpler than that, at least using the state machine. For now, that concludes the story about the Anatomy Of A (Roguelike) Endless Wave System. I will let you know if it has some further improvements, but for now system seems to be working solid. My artist did a cool laser animation today, things are starting to look pretty good! Hello, this time i wrote about something different on my website, but equally important. Many of you (myself included) experienced burnout due to too much work. Here's some advice on how to avoid it. Hope you enjoy the read! Drink water and tea, not sodas full of sugar. Besides sleeping enough and eating healthy, exercise is one of the most important things in whole thing of staying mentally stable when working on a game. Get your juices flowing, ride a bike, pump some iron, run, cross fit, whatever makes you sweat. You will feel better, happier, healthier, have more energy to work, need less sleep, wake more rested and most important of all, have your brain functioning better due to improved blood flow. If you are like me, sitting in the office for 8 hours staring at a screen (like most of us actually) and then doing that again in the afternoon, be realistic, it does horrible things to your body and mind and you must be fit to endure it. I started making backgrounds for my little game and i'd like to share a technique i use with you. There's a cool nebula generator on https://29a.ch/sandbox/2011/neonflames/ where you can generate random nebula swirls by choosing colors, messing with parameteres and simply drawing on the screen. Here's how the generated nebula looks like. Though pretty, it's not something we could actually use in a pixel art game, huh. So let's fire up our favourite photoshop since we'll be doing some tricks. First we change the image to indexed color so we can lower the number of colors in the image. I usually use 16, there's really no more need for more than than, even less is welcome. After that we get it back to RGB for editing. I use a very useful filter under Artistic > Paint Daubs which rounds up the edges and makes it look like it's hand drawn. The colors are usually nicely separated so we can select them with magic wand and cut out the separate layers for better manipulation, or select the color range if we want some transparency and not so sharp look. Then comes the hand drawing part. In this one, i placed some big stars and hand drawn some gradient layers that follow the nebula shape and lose brightness as the go away from the star to simulate some depth and bring more color into the image. You can knock yourself out with drawing planets, any texture drawn is usually fine, but it's nice if they match the nebula color (i got two in the image which will be moving in separate speeds for distance simulation, you can spot a dark one in the upper left corner of the nebula). Additionaly tweak the layers' transparency, you can play around with the overlays too, generate a starfield and tint it to match the color and voila!